Developing a community of trust is imperative to the success of any workshop or consulting project. A facilitator’s first task must be to create an environment that is safe, invites feedback, and encourages positive dialogue. Weaving Appreciative Inquiry into one’s facilitation allows individuals to develop supportive relationships with one another while co-creating shared goals and actionable items for an ideal learning experience. Icebreakers are often used at the start of any workshop/project as a means to engage individuals and provide them with the opportunity become acquainted with one another. In my experience, engaging participants in a mini-inquiry is the best ice breaker exercise for the group to develop a sense of community almost immediately. The questions used in these mini-inquiries are written using unconditionally positive language. These questions are meant to create a context for learning and appreciation, and begin to foster a sense of trust amongst classmates. What do we want to achieve together? How can we make this happen? What three wishes do you have for this training/workshop/retreat? I post several inquiry questions on the AV screen located at the front of the room and ask participants to take a moment to read each of them. Next participants are tasked with pairing up with as many new people, or people they may not know well, as possible. Once the student has paired up with someone, I instruct them to introduce themselves and ask one question from the list of questions on the screen. After their partner has answered, it is their partner’s turn to choose a question. Once each person has asked and answered a question, they are to find new people to pair up with and repeat the process. The length of this exercise is determined by the size of the group; however, for larger groups I may limit the time to ten to fifteen minutes. Once the mini-inquiry exercise has concluded, the group and I will co-construct an appreciative agreement. 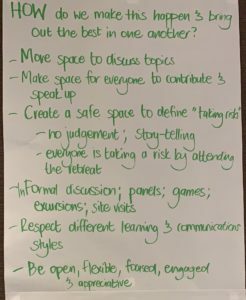 Contrary to ground rules, which often state what not to do in class, appreciative agreements flip the script by asking participants what would best contribute to their learning in this workshop/project. I have seen Appreciative Agreements crafted a number of ways, but my favorite method was taught to me by Kathy Becker and Ezelle Theunissen. Step 1: Divide the group into small teams (no more than 6 in a team). Each small team will need to identify three people that will serve as the facilitator, the recorder, and the reporter. The facilitator will facilitate the team’s discussion (ensuring everyone has an equal opportunity to speak) and keep track of time. The recorder will write/record the team’s answers onto a clean sheet of flip chart paper. The reporter will report-out the team’s answers when it is time to share answers in the plenary. Once the roles of facilitator, recorder, and reporter have been assigned within each small team, you can reveal the two questions to the group. As the trainer/consultant, it is vital to explain the importance of the Appreciative Agreements. This exercise will help us get a sense from you about what you’d like the retreat to look like, and what you’d like your role to be in that. There is no wrong answer – please answer as candidly and with as much detail as possible. Once you’ve shared this in your small group, we will come back into the larger group and collectively craft some basic agreements on what we want our time together to look like, what we wish to achieve, and how we will work together to make it happen. Appreciative agreements can include items/activities, such as: allowing all voices to be heard, providing constructive feedback, have fun, no screens (cell phone or tablet), etc. Once the group has generated a list of items for the agreement, I will revisit each item and ask the group how we can demonstrate this action – specifically, what offers, commitments and requests can each of us make to ensure that we, as a group, live into our shared appreciative agreements. After constructing the group’s appreciative agreements, I will post the agreement on the wall where it is visible to all. I will remind the group that our appreciative agreements are a living document that is open for change and modification as we progress through the course. Each day I will check in with the class to see if we are living into our agreements and if any changes need to be made to reflect the needs of our group. The appreciative agreements will be kept on the wall for the duration of the course to remind everyone of the commitments we have made to one another and to our learning. By engaging in inquiry and co-designing appreciative agreements with students, the class is collectively creating the foundation for their ideal learning environment while generating specific practices to move the class toward those ideals. The level of engagement amongst students is dependent on how well the class, including the instructor, adheres to the shared commitments on the agreement. It is important that the instructor revisit this document often throughout the duration of the course to ensure that the document still holds meaning to the students. If the document no longer holds value to the students, the instructor may wish to facilitate the exercise again to create a new agreement. This entry was posted in Appreciative Articles, Appreciative Inquiry on January 14, 2019 by Melissa Robaina.